There are a few types of desserts I like to think I've mastered over the years. The layer cake, for example, and my most favorite dessert of all - pie. Though it did take some practice. I still remember my first homemade pie I tried to make for Thanksgiving. The crust fell apart, and I had to doctor it up with store-bought crust; and the filling turned into a very runny, liquid mess. But, like I said, it's a dessert I've definitely learned to make well over the years, and here are a few tips and tools that make for a yummy (and very pretty) pie. 1. If you can't make home-made crust, it's okay. While you're never gonna get better at crust without practice, if you're making pie for a holiday or event, there is no shame in store-bought crust. After tasting many different ones myself, I'd say Pillsbury and (no joke) the Great Value brand crust in the refrigerated section are definitely the best when it comes to taste and texture. 2. If you are making the crust homemade, the two biggest tips I'd give are to start with all-cold ingredients, and to not over work the dough. You can see more tips on this step-by-step guide to homemade pie crust. 3. Think beyond traditional crusts. If you're making a cold pie that calls for a graham cracker crust, for example, you can swap out the graham crackers for any number of things if you're making the crust from scratch. Follow the same directions you would for the graham cracker crust using something like Oreo's, Nilla wafers, pretzels, or ginger snaps in place of the graham crackers. 4. Pre-cook fruit filling. 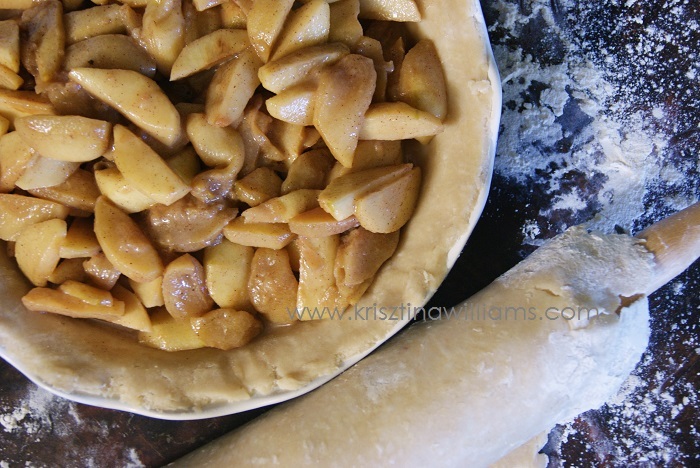 This is a method I only started to use in recent years after I used a recipe from Williams Sonoma for Caramel Apple Pie. Sauteeing the apple slices before hand helped to soften the fruit and helped to get the juices out and thicken the filling before it was put in the crust, preventing the crust from getting soggy. 5. Experiment with liquid flavorings. There are so many other liquid flavors and extracts aside from the traditional vanilla extract. I love to mix in maple flavoring with pumpkin and pecan pie, for example, and almond extract with cherry pie. 6. Use different baking dishes. 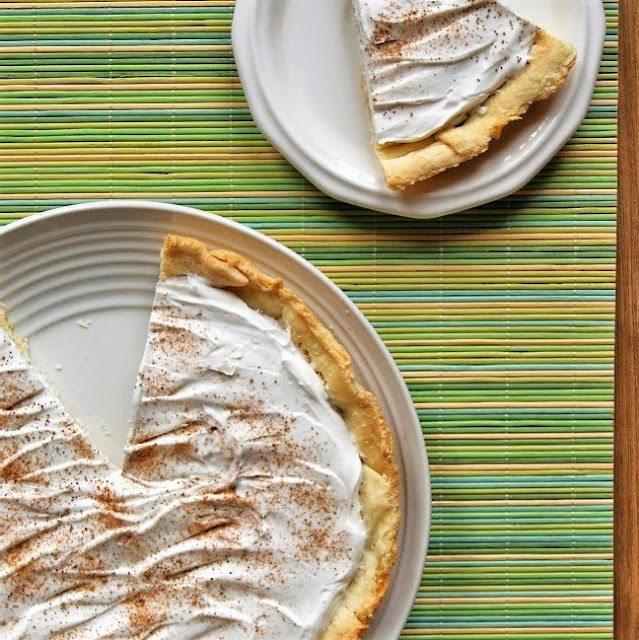 Who says you have to use a 9-inch pie plate? You can use a casserole dish to make a cobbler, or my personal favorite, use a muffin pan to make mini pies. I love it because of course it's great for entertaining, but also because I am all about the crust, and with mini pies, you get more crust in each bite. If you are sticking with a traditional pie dish, there are so many cute options out there these day. 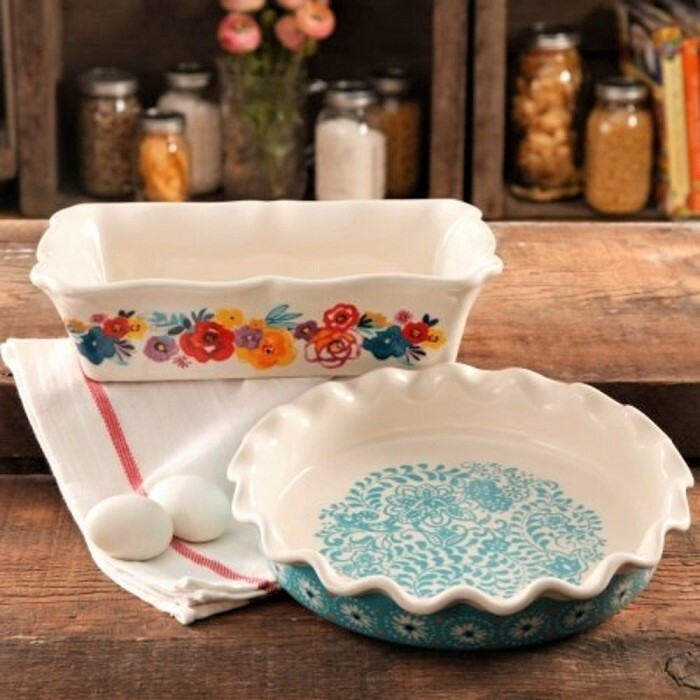 I love the Pioneer Woman Stoneware Pie Dish pictured above. 7. Make decorating easier. You can spend a lot of time making a traditional lattice-top crust, or you can create something equally beautiful with a simple pie-top cutter. You can also create a decorative pie crust using cookie cutters. 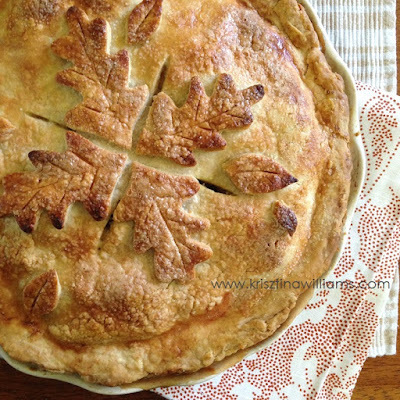 I created the look on this apple pie with my fall leaf cookie cutters. Though I do prefer how these pie-top cutters are reversible. You could use it, for example, either to create cut-outs or to create additional shapes to place on top the the crust, or both. My husband and I both love pie. We like fruit pies, pumpkin pie, pecan pie...a whole lot of pie. Which ones are your favorite? I tend to go for dessert pies, particularly blueberry or cherry or apple. There's a dinner pie made here in Canada you should have a look at- tourtiere. It's a meat pie from Quebec, and there should be recipes easily found for it. That sounds interesting...I'll have to look up a recipe for that! It is often a Christmas Eve main dish in Francophone communities here, but the popularity of it has spread into English Canada. I love those pans! I bake every once in a while but I definitely need to invest in some better/prettier cookware! Me too! I have several basic pie dishes, but it would be nice to get one of the pretty stoneware kind. I love pie...but I can't bake one!